There is no doubt that Judge Chigumba has lost both legal, moral and witchcraft authority to lead ZEC and Zimbabwe elections in future. Judge Chigumba is the first ever elections chairperson on earth and in heaven to host presidential elections on 'Zimbabwe Stock Exchange'. According to the latest results Nelson Chamisa's performance has been positive and promising while ED's has been on red. This piece therefore seeks to support the view that Justice Chigumba should not only relinquish her duties as a ZEC chairperson but also her title of a judge. In 1996, the then minister of education, sport and culture Edmund Garwe relinquished his position as a minister after leaking the Zimbabwe Junior Certificate exams to his beloved daughter. Garwe later committed suicide the following year because of the alleged stress imposed by humiliation. I am very happy that Garwe did the best thing by accepting to resign. I won't be surprised if Justice Chigumba is to follow the footsteps of Edmund Garwe because she has tarnished the image of Zimbabwe on earth and in heaven. Right now, no one knows the actual presidential results i.e. the ones announce on television or the ones on ZEC website/CD (published in Herald) or the recently deflated and inflated ones. I do not know how the ZEC and ZANU PF teams are going to argue on this in court? If the court is going to avoid this misnomer, then allegations that the Zimbabwe's judiciary is not independent will be confirmed. 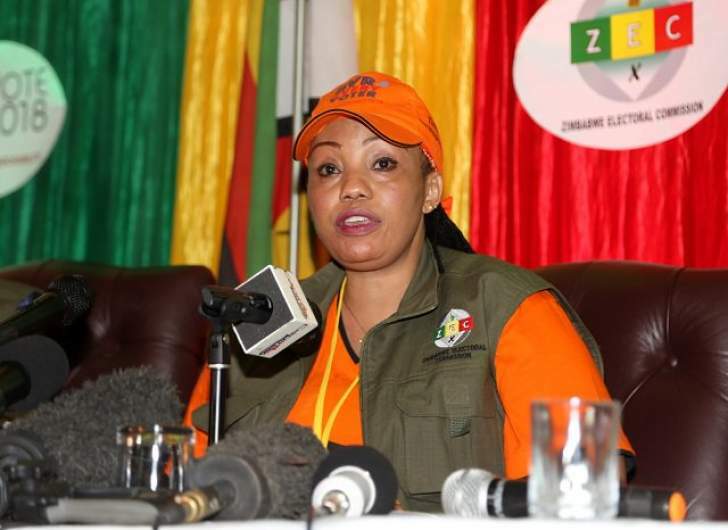 There is no law that gives Judge Chigumba and team mandate to deflate and inflate the announced results according to the law without the approval of the party agents (who were involved) and the constitutional court. Komichi told the entire world that the presidential results were nor verified but ZANU PF government decided to arrest him. Why should we trust results when those announced on Television and the ZEC's CDs are different? This kind of evidence and behavior of ZEC in enough to nullify the announced presidential results. The Zimbabwean Constitutional Court Judges are now under the spotlight. Just watch the space. There is no doubt that Judge Chigumba has just joined the league of Charles D.B. King who broke the rigging record in the presidential elections of Liberia of 1927. Out of a total number of registered voters of 15,000 King of True Whig Party got 243,000 votes while his close contestant Thomas J. Faukner of People's Party got 9,000 votes to make it 10+4=40. The voter turnout recorded was 1,680% he broke the earthly and heavenly record. However, Judge Chigumba has just broken a new record of its own kind by posting the presidential results on 'Zimbabwe Stock Exchange' and they are still fluctuating since the day they were announced. Zimbabwe has just lost an opportunity of reengagement with the international community because of the way Judge Chigumba handled the 2018 elections. United States of America has just signed ZIDERA into law because of Judge Chigumba and Chiwenga. I want serious Zimbabweans to blame the two for ZIDERA because America signed it into law after observing the way Judge Chigumba mishandled 2018 elections. The ZANU PF government unleashed the army to kill 6 if not 10 innocent civilians and injured more than 4 crates. America is already convinced that Zimbabwe is now under military rule. I therefore want Judge Chigumba to accept her potion of blood from the 6 innocent civilians murdered by the army just soon after elections. The 2018 elections were supposed to be the benchmark of Zimbabwe's reengagement with the international community but because of Judge Chigumba, nothing is likely to change. The conduct of Judge Chigumba of inflating and deflating presidential results (at night) in ZANU headquarters should be condemned by the living and dead spirits in Zimbabwe. There is no doubt that ZIDERA was signed into law because of Judge Chigumba's mishandling of elections and the killing of 6 innocent civilians. I am now calling upon Judge Chigumba to resign from her positions as a ZEC's chairperson and a high court judge. If ZANU PF government managed to sent Levi Nyagura on suspension, they should also remove the title of a judge bestowed on Judge Chigumba. There is no difference between Judge Chigumba and Edmund Garwe, Charles King and Morrison Nyathi who sold out at Chimoio and Nyadzonya. If the genuine PhD of Doctor Amai is to be removed, I will also urge the responsible institutions to consider recalling the law degree certificates of Judge Chigumba. She has betrayed the future of the generations, she provoked the deaths of 6 innocent civilians, she forced America to sign ZIDERA into law.